Allan C. Morrison, 83, of Lyndeborough, NH, passed away on Sunday, December 2, 2018, in Merrimack, NH, after a period of declining health. Allan was born on September 7, 1935, to John and Hazel (Chase) Morrison, in Nashua, NH. 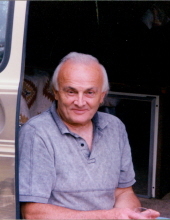 Allan owned and operated a used car and auto salvage yard in Milford for many years. Allan is survived by his daughters, Sandra Morrison and Julie Morrison, of Lyndeborough, NH; his son, Tony Crawford and his wife, Melissa, of Hooksett, NH; and his grandchildren, Timothy Smith, Tiffany Christman, Jake Morrison-Bechard, Hunter and Delaney Crawford. He is also survived by his ex-wife, Rachel Lemere, who had helped him in many ways over the years, and his step son, Rickey Kennett. In lieu of flowers, donations may be made to the Community Hospice House, 210 Naticook Rd, Merrimack, NH, 03054. To send flowers or a remembrance gift to the family of Allan C Morrison, please visit our Tribute Store. "Email Address" would like to share the life celebration of Allan C Morrison. Click on the "link" to go to share a favorite memory or leave a condolence message for the family.